It’s been a very long time since we bought anything that could be remotely associated with the term “souvenir” when we’re traveling. In the early years we’d bring home the odd T-shirt, or even a mug. We usually eschewed all those bits of knick-knacks that are always on offer no matter where you’re traveling. Even in cities like New York, look hard enough and you’ll find city memorabilia. Just take a walk down Yonge Street in Toronto and you’ll be assailed with all manner of flags, sweatshirts and crystal reproductions of the CN Tower. But not for us. Travel shopping has taken on a whole new meaning. The pleasures of consignment shopping on vacation are legion. And although we’re not vintage people (the only antiques you’ll find in our home are a gramophone Art inherited from his parents and an antique organ left to our son Ian by his grand-father that we’re housing until he puts down permanent roots or we sell it: whichever comes first). We like to be surrounded by new. But that doesn’t necessarily extend to everything in our lives. Case in point: our recent trip to Puerto Rico. It all started two years ago when we spent a few days in San Juan en route to a southern Caribbean cruise. 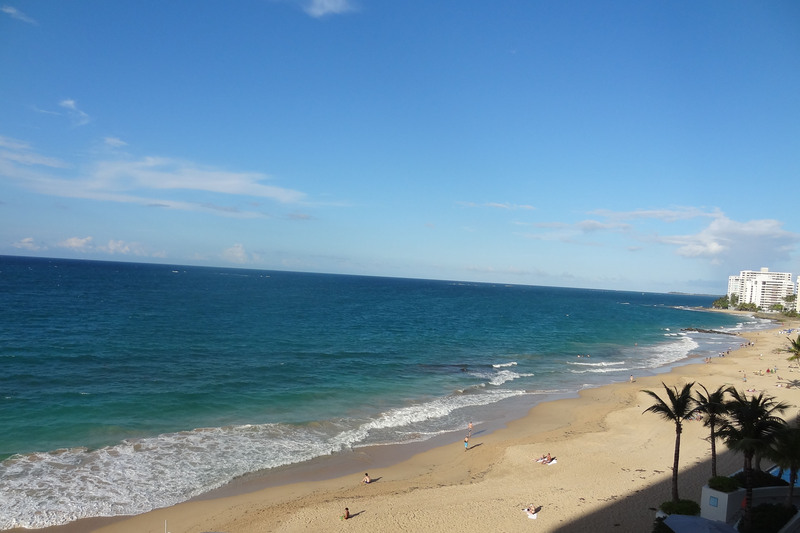 We had been in San Juan only once before – and only for one day. We had not been impressed. This time, however, we decided to give it a try. We discovered a city and an island that has the best of the old and the new. With miles of pristine beaches to walk, rain forests to explore and shops to discover, we were in heaven. 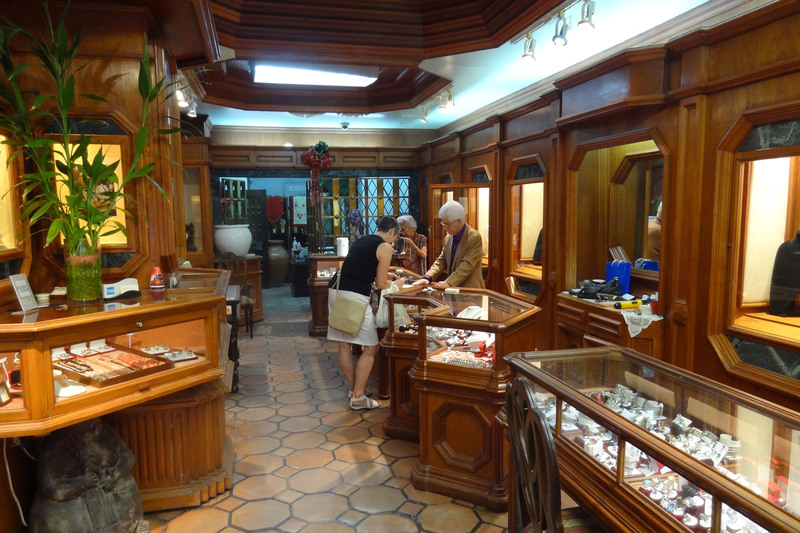 On our last day in old San Juan as we wandered among the cobble-stoned streets lined with restored 400-year-old Spanish style buildings, we stumbled upon a small shop whose windows were filled with the most extraordinary jewelry we’d ever seen. Although we had already done our requisite vacation shopping (and had reached our customs limit which we will never exceed since we value our Nexus cards), we knew that we were window shopping only. We entered. We chatted with the proprietor who knew that we were not buying, but that didn’t matter to him. He was delighted to show us anything and everything. Every necklace he put around Patty’s neck, every pair of shirt studs he showed Art all had a story. And these were stories we vowed we would return to hear more about. So, last month we were true to our word, and the shop was our first stop in old San Juan. With an unassuming exterior, Ramón López’s shop on calle Fortaleza is a treasure trove of history and beauty. And the proprietor himself, who next year will celebrate 50 years in business in this exact location, is a true gentleman, proud of his work and clearly possessed of an extraordinary eye for quality pieces. 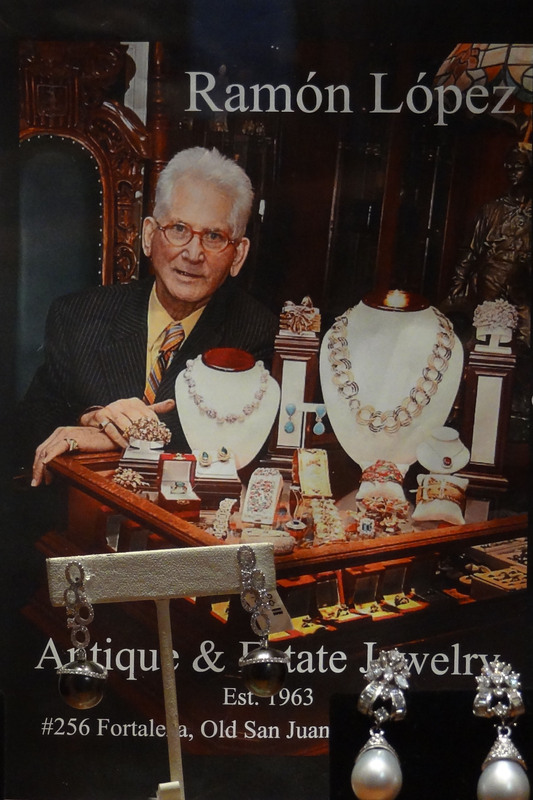 Sr. López is a well-known figure in the vintage jewelry business, having been featured in magazine articles over the course of his storied career. His pieces are acquired mostly from direct purchases from Puerto Rican estates. As we tried on piece after piece, we were swept back to a time in San Juan’s history when the grand ladies would alight from carriages and make their way to the Teatro Tapia, built in 1832, now one of the oldest theaters in the western hemisphere. Their ball gowns would be exquisitely complemented by the necklaces adorning their throats and the bracelets dripping from their wrists. 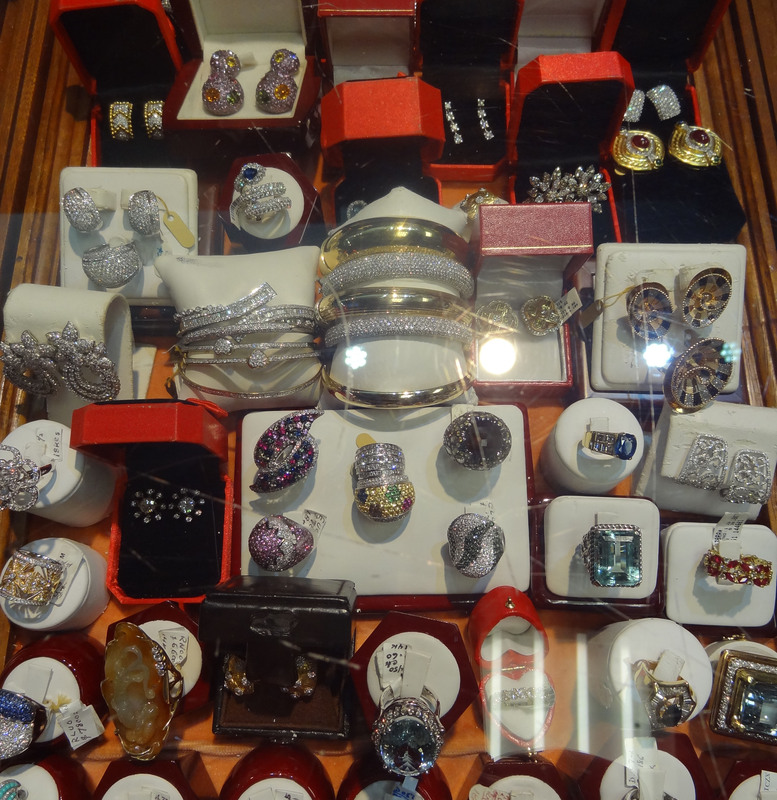 And now those pieces are in the cases at Ramón López Vintage and Estate Jeweler. 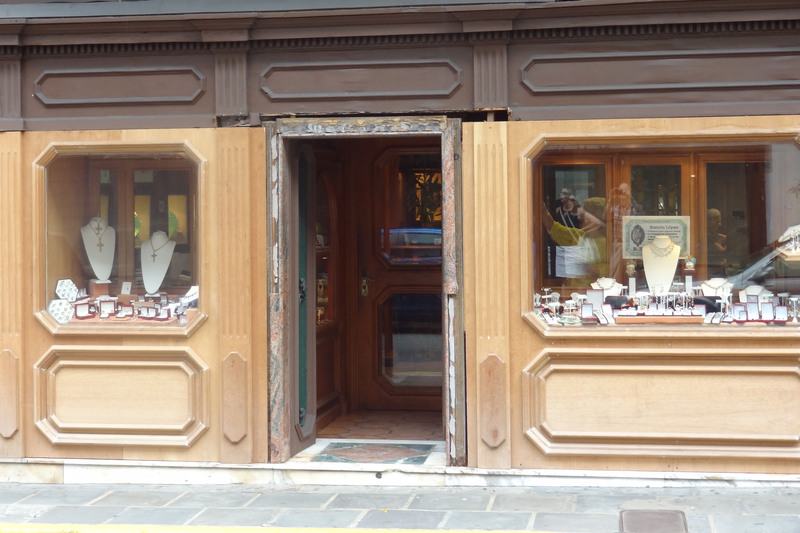 As Sr. López offered piece after piece of jewelry for us to try, Art commented that he had remarkable sales skills. The display cases were filled with thousands of pieces of jewelry from Puerto Rican estates. “No,” he said shaking his head, “There is no need when you have the merchandise.” With that he clasped another bracelet onto Patty’s wrist. So right he is! Before we left, he shared with us several photos of his children – one a lawyer, the other a medical student – and introduced us to his wife, a lawyer, who looks after the business end of things now. We waved good-bye as we assured him we’d be back – then we emerged back into the brilliant sunshine of old San Juan. Oh, did we buy anything? But of course! Ramón López is located in old San Juan at 256 Fortaleza. It’s finally here! The first day of spring, not a cloud in the sky and we’re dreaming of spring cleaning – cleaning out the closets, that is. And thinking about that reminds us of the fun we’ve had searching out the best consignment shops in various places throughout the world, most recently in California. It’s true that thoughts of shopping leave some travelers cold; but for us, we prefer to leave our shopping to vacation time – all the better to work hard, avoid the shops while at home, and spend hard-earned money on travel. The fun of shopping on vacation lies not in the actual shopping itself (although occasionally we have what we refer to in our family as a real “shopping experience” wherein the excitement of the find is almost too much to bear); rather the fun is in the search for the shops themselves, searches that often take us to parts of cities that we might not otherwise visit. Those searches have often resulted in great city walks and serendipitous discoveries of fabulous restaurants. .
First, a bit of background: We are decidedly not antique people, and would not go around the corner for a dusty piece of old furniture (apologies to antique aficionados among our readers – but that just leaves more great stuff for you). We would, however, venture into shops that carry vintage clothing to poke about looking for a ‘find.’ Not necessarily what you would term a bargain. Sadly perhaps, we are not bargain shoppers. We look for value and a true experience. A discerning shopper knows that a bargain is often not truly ‘a find.’ Webster’s dictionary defines a bargain as “an article bought or offered at a price favorable to the buyer…” Well, a bargain is not good enough for it to be ‘a find’ in our view. The price has to be what we are willing to pay for the feeling, the experience, the emotion that the piece evokes. If it’s also a bargain, then so much the better. Three recent experiences serve to illustrate the experience that can be had with just a little bit of planning. We happened upon Caprice by accident the first time, but have returned several times since. Our first real vintage find came in Nice, France. Just as you might expect, Vieux Nice [Old Nice] is home to a variety of interesting and off-beat shopping that includes vintage clothing and antiques. We happened upon this particular find as we wandered through the labyrinth of narrow streets that are now more often home to tacky tourist shops filled with snow globes and cheap T-shirts. However, this is France we’re talking about, and some of the streets are lined with quirky artists’ studios and galleries, scrumptious bakeries and wonderful shops that sell vintage clothing and handbags. This little one beckoned. Located at 12, rue droite, Caprice had a welcoming vibe, in spite of its apparently chaotic displays. Don’t be fooled. There are some very real finds in this little store and the shop girls know where everything is – and often their provenance. .
As Patty made her way down the steep, narrow stairway to the basement level, Art found himself contemplating a red leather jacket he saw hanging over the stairwell. He asked the clerk if he could have a closer look at the item. She was more than willing to oblige, and brought the jacket to him. It turned out that it was an original Christian Dior from the mid-1970’s in the style of a blazer – soft red leather piped with white, a design that never goes out of style. But would it fit? There was only one way to find out. Art beckoned Patty to return to the main floor to don the jacket. It fit as if it had been made for her. We were able to get a slight reduction in price for paying cash. Fortunately, we were carrying a bit of a wad of Euros! But, we were hooked on the idea of doing a bit of vintage and/or consignment shopping. Sure, you need to see all the landmarks - but the addition of some consignment shopping can add another fun dimension to your travel. Washington D.C. is more than monuments! In Washington D.C last year, we made it a point to research the consignment shops before leaving home. After all, we reasoned, what better place could there be to find clothing that might have been worn only once or twice to a diplomatic ball or cocktail party? 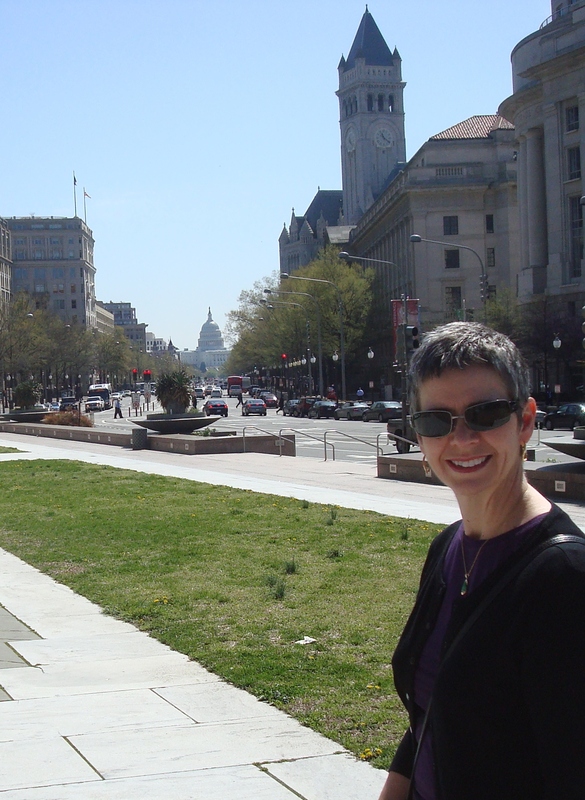 We had our map and were easily able to find Secondi on the second floor of a building in DuPont Circle. If you’re in the market for some real upscale design pieces, this is the place. We came out with a mint-condition Dior handbag and a great story to tell. 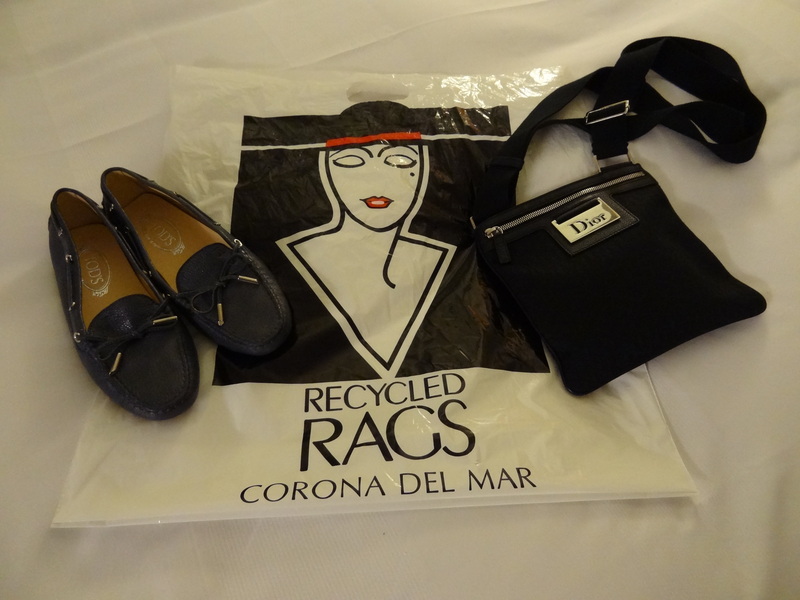 And just last month, on a day trip along the tony coast south of Los Angeles, we researched the consignment shops in Corona del Mar. We visited several, but our favorite was Recycled Rags. What a fabulous place. Crammed with well-displayed and only slightly pre-loved clothing, the store is a treasure trove of labels and ‘finds.’ The shop staff was friendly and knowledgeable, chatting away while working feverishly to help. With our 23-year-old son in tow, we were obviously hoping to find a place that also carries men’s clothing – and this one does (although Ian who loves nothing more than to browse the consignment shops especially in London, didn’t find anything in his size). We also shy away from pre-loved shoes; however, we pounced on several pairs of Tod’s women’s shoes that looked as if they must have been someone’s grand mistake. If they had ever been worn, it must have been only while the wearer was sitting or lying down. They were in new condition. And they fit! We happened upon another Dior bag (this time a little one) and happily exited the store with our finds. These Tod’s shoes that retail for over $400.00 were around $130.00. Heaven! And a terrific afternoon’s experience. Do your homework. Part of the fun of traveling in general is preparing and dreaming about what’s to come. In the case of consignment shopping, the web is your best friend. Find the names of shops in the general area where you want to visit and scour their web sites. Read some reviews. What are people saying about the shops? What kinds of merchandise do they carry? Which ones resonate with you? Map the location and incorporate some of the other attractions you’d like to see along the way so that you can put it on a walking tour. Keep your expectations low. That way you’re more likely to be pleasantly surprised. When you get there, take your time and think of it as a museum experience. If you’re looking for pieces of clothing, remember that if the piece is actually older than the last couple of years, the sizing was different. In any case, try everything on! Here are a few more tips from a professional shopping consultant: Five Tips for Shopping at Consignment Stores. 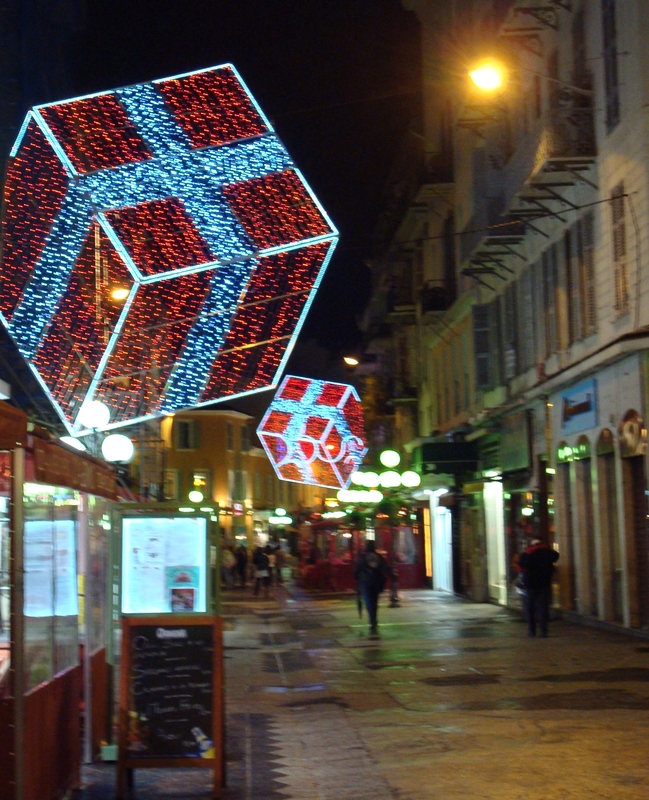 Christmas shopping in Nice: It’s better on the Riviera! Travel memoirist Bill Bryson once wrote: “We used to build civilizations. Now we build shopping malls.” And for many of us who celebrate the festive season by exchanging gifts, the shopping mall becomes a second home at this time of year. But for us discerning travelers who would rather save our money for an Executive-first class ticket than buy one another something that will end up at the Salvation Army thrift shop in six months, we take a slightly different approach. The fact that we rarely spend Christmas at home (as discussed earlier in reference to a Christmas cruise!) does give us a bit of a distraction. Leaving the house in the good hands of our house-sitter, we take very little in the way of gifts with us: we’ll do our shopping when we are on the ground in the south of France, and that shopping will be minimal. It’s the experience of shopping in Nice that we really like! Nice is the closest thing to a ‘city’ that is within a reasonable taxi drive of where our son works in Monaco. About 30 minutes by cab from Monte Carlo, Nice has a population of fewer than 400,000 making it large enough to have shops, services and hotels in abundance, and small enough to be happily walkable. Add on to that its charming old quarter (Vieux Nice), its Christmas market and its fabulous festive decorations, and you end up with an experience that puts you in the Christmas spirit like nothing else can. 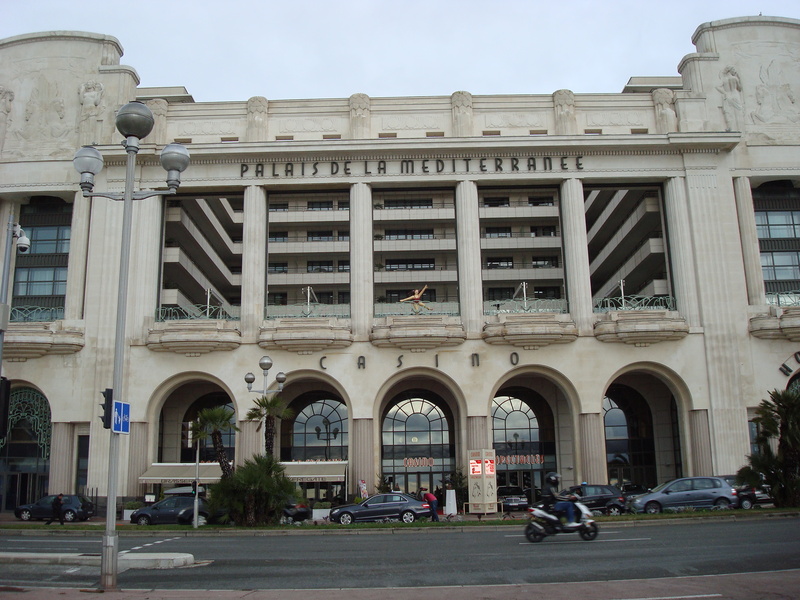 When we arrive in Nice, we’ll check into the hotel Palais de la mediteranée on the Promenade des Anglais that stretches about six kilometers along the beachfront. Then we’ll spend a day wandering the shopping streets and lunching at a pizzeria near the market. We’ll watch the Nice residents stroll on the boardwalk (it’s actually paved) and we’ll visit the local Galleries Lafayette, the famed department store. It’s not quite like its Parisian sibling, but it has three floors of ‘stuff’ that isn’t readily available in North America. 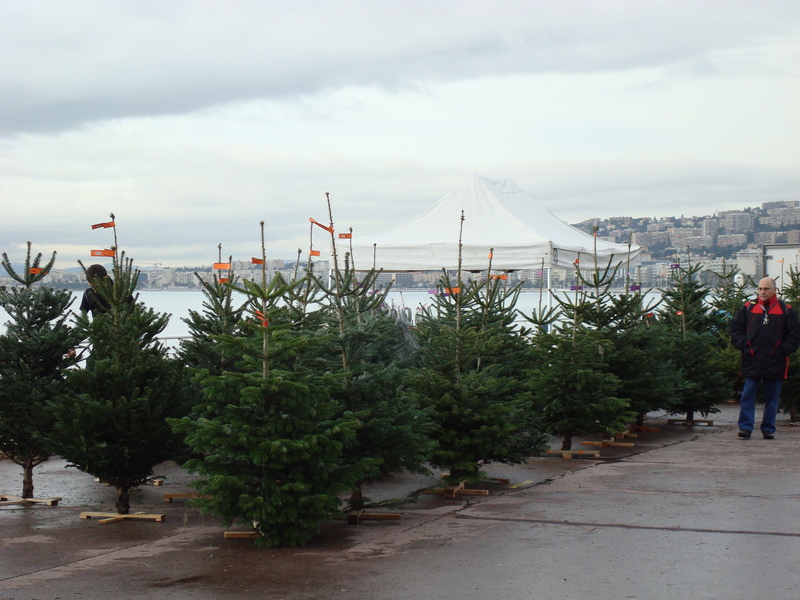 Then we’ll do some strolling of our own and watch the local residents pick up their Christmas trees from the lot on the waterfront, and wander among the snow-covered trees all around the place. 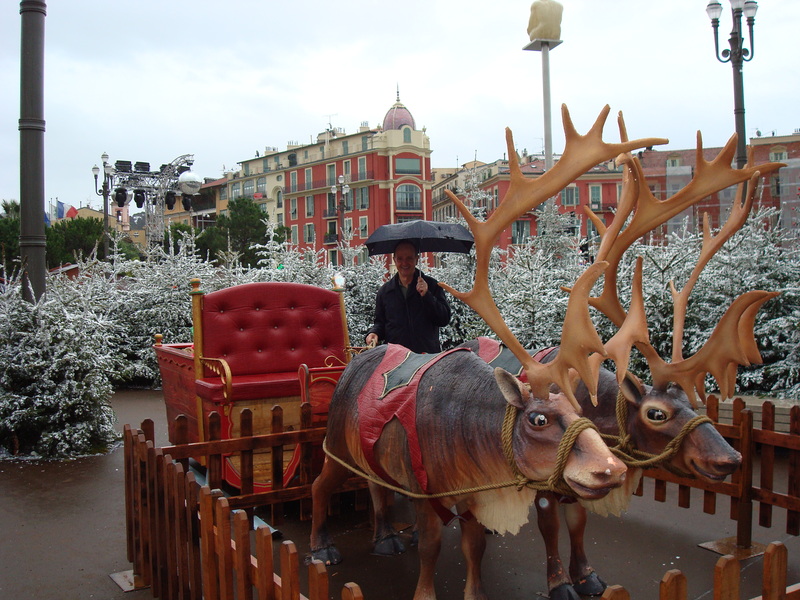 Does it snow in the south of France at Christmas, you ask incredulously? No, it actually doesn’t. The snow is fake; those of us who reside in more northern climes always find it hilarious how snow seems to be worshipped as the very essence of Christmas. It’s clear no one along the French Riviera has ever had to spend a morning shoveling to get a car out of the garage. After we pick up one present for each other and a few for the son, we’ll leave Nice behind us to head to Monte Carlo and a ballet premiere. When we get back, no doubt we’ll have more stories to tell! Art surrounded by "snow" covered evergreens in Nice.